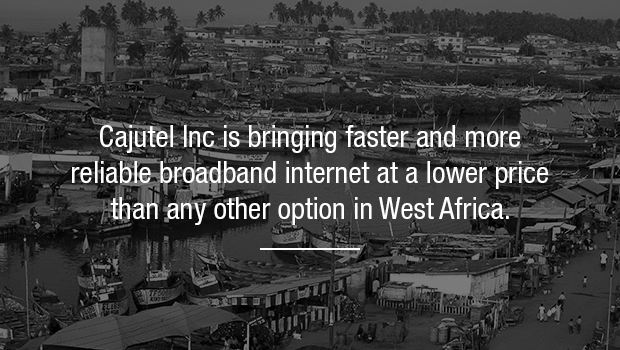 Cajutel Sarl, a company from Guinea-Bissau is building infrastructure to serve the masses in west africa with high speed internet at affordable prices. Building the non existing infrastructure is at its core and provides a long term return. Cajutel has now moved to the cryptocoin market as a modern way to raise its needed investments for this infrastructure and thus is probably the first DAO (Distributed Autonomous Organisation) in Africa. We are starting in Guinea-Bissau, a country with a population of 1.7 million, and that ranks very close to the bottom in world rankings of literacy, GDP per capita, and Human Development Index. The Internet can help to change all of this. Guinea-Bissau currently has no 4G, no 3G, not even 2.5G (EDGE). 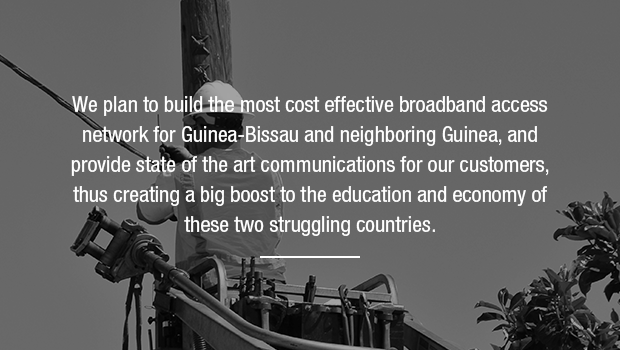 Cajutels is building the infrastructure from the ground up to bring reliable highspeed broadband internet at affordable prices to West Africa. This will bring education and business to the region while giving millions of users first time access to the wealth of knowledge that exists online. This is a clean build: We aren’t retrofitting existing infrastructure, we haven't invented some device that will improve efficiency by an enormous level -- we’re simply bringing the infrastructure that exists elsewhere in the world to a region where it does not exist. We’re building a network from the ground up. This will take significant upfront funding, but it will open up so many opportunities that simply can't come to fruition under the current system. 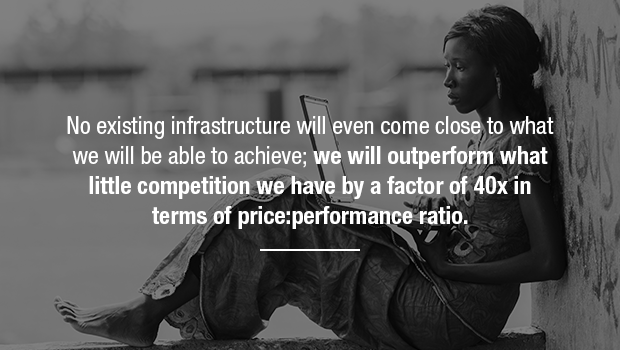 Internet in West Africa is very slow, very expensive, and very unreliable. There are only two mobile operators, both of which focus almost exclusively on voice communication but not 3 or 4G data transmission. The only reason these carriers provide interest is because they are required to by law. There is literally zero incentive for them to make it fast enough to actually use or cheap enough to actually afford. These systems are not worth saving or improving. Instead, Cajutel is starting from the ground up, building an entirely new system that will be far superior in every conceivable way. The 98% of Guinea-Bissau’s population that has never had access to the internet on their mobile devices will come online for the first time. Our vision at Cajutel is not some far fetched idea -- we simply see a world full of communication, a world in which people are brought together by technology which helps to overcome differences. A society in which individuals, organizations, and communities have unlimited access to one another, and to a world of knowledge. The internet makes all this possible, but some people still don’t have access to it. Not reliable access, at least. Think of the business trader who wants to find business partners abroad -- with reliable and affordable internet, he can finally research them on the internet and establish contact. Think of the government office that can now access Google without having to wait 20 minutes. At the very least, think of the coffee shop that can now stream live sporting events or news stations. Internet will bring business, education, and overall growth to a region in desperate need of it. 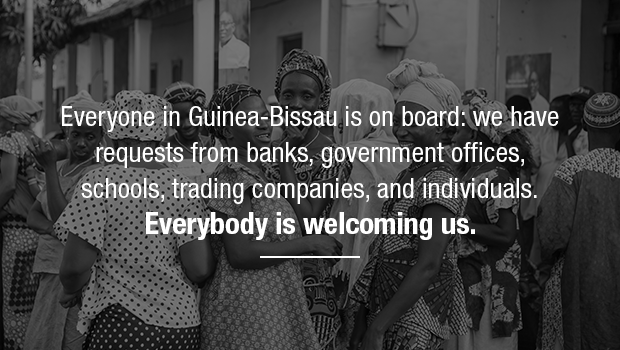 Starting in Guinea-Bissau, Cajutel will also soon expand to neighboring Guinea -- a country with a much larger population of 11.75 million -- and all throughout West Africa thereafter. We have partnerships with installers and retailers lined up. All the plans are in place and our license has been filed with the government. We are currently sourcing all our equipment need. Build and install all equipment and towers. -- this is the bulk of the expense. Acquire users. Word of mouth is huge in West Africa, but we also have partnerships with small shops and kiosks already in place. Andreas has over 20 years of experience in telecommunications. In 1992 he started an internet provider named Ping Net GmbH in his home country of Switzerland, in the very early days of the internet. Ping Net GmbH was the first ISP focusing on individuals in the country. By the end of the 90s, it was sold to World Online International, a pan European internet service provider which went IPO shortly after. Andreas then worked for Cisco Systems in the areas of SS7 signaling and telco switching until 2001 when he started Global Networks Switzerland AG (now SMSRelay AG) which develops and builds GSM infrastructure for mobile operators. Global Networks Switzerland AG also established a GSM network in Antarctica. In 2003, Andreas launched BebbiCell AG, a mobile virtual network operator (MVNO) initiative with combined GSM/VoIP service offerings which was successfully sold a couple of years later. In 2010, he purchased the failing e-max network in Iceland and converted it into a mobile high speed network for the country. e-max was sold in 2013 to 365 ehf and now has over 500 base stations covering a big portion of the population, especially in the rural areas. Andreas currently owns DataCell ehf, another Icelandic corporation offering Datacenter and hosting services, as well as Backbone ehf which operates a backbone network in multiple continents and Fink Telecom Services , a swiss entity which plans, build and develop networks, telecom infrastrucure and software. His know-how in operating a wireless network in harsh environments is rare, but can be easily transplanted into other countries. After a consulting project in West Africa in 2003, Andreas saw the need to bring his expertise to this area of the world next. David is a Brit who has lived the last 20 years of his life in various West African countries, and currently holds a Guinea-Bissauan passport. He has built TV and radio broadcast stations and MMDS relays in Senegal and Guinea-Bissau and knows very well how to build low cost networks and how to deal with African government and institutions. He is well networked within the region which is vital for this project. Cajutel has decided to raise its funding through a cryptocoin token sale (ICO, initial coin offering) in the very near future . If you leave us your email address here, we will send you the business plan today and inform you when the presale begins. You email address will not be used for anything else and will be removed after the presale information is published.